Nearly five years ago, a band called Cosmoscope entered the Atlanta music scene. For years, their sound progressed to the point where Cosmoscope was no longer the sound or image that they started with. As the time approached to record their next EP, they knew a fresh start was their best bet. By the time For The Dearly Departed was recorded, the transformation to The Funeral Portrait was complete. The physical spiral for the album artwork is not only a representation of the album’s theme but a representation of the band’s constant dedication. They are constantly moving to challenge themselves and churn out content that is the best version of themselves. That translates on the record as well as on stage. The experience the listener has while listening to the record is the same experience live. The sound for A Moment of Silence was less drums samples and more organic. They’ve taken the basics of different genres – ranging from rock, heavy metal and pop – to create a blend of what they currently love listening to. “I think we’re going to be one of those bands that change sonically every record or every time we put out new music just because what we listen to always changes and what we’re inspired by always changes. I think that’s the big thing that we brought to the table this time around,” Jennings said. 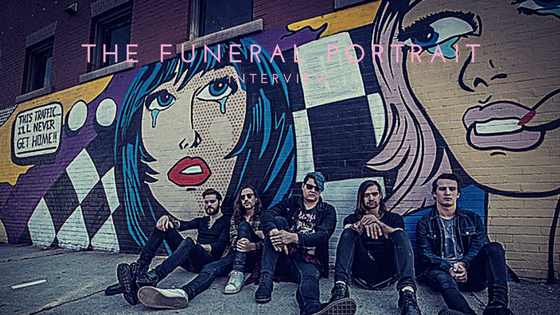 The Funeral Portrait’s next album might not be a sound that is recognized as theirs right away, but it will be a sound that they worked hard to perfect.